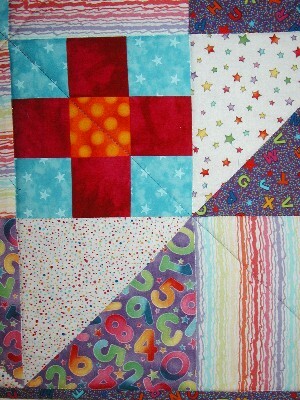 Like the last one, this quilt was finished just in time for the baby’s first birthday. 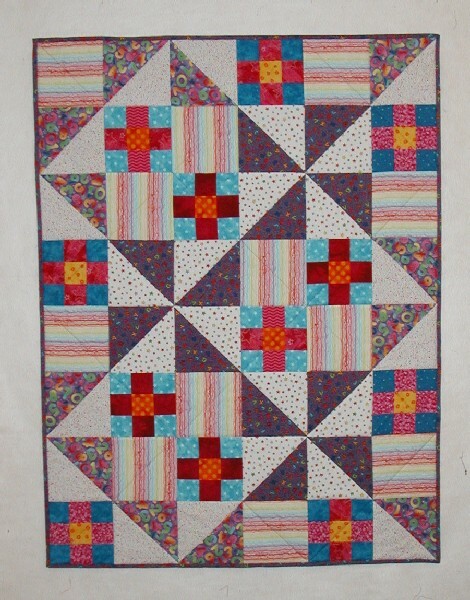 In deciding on the design, I started with a picture of the quilt I made for the baby’s brother a few years ago and then went through my baby quilt ideas folder and pulled out patterns with half-square triangles and pinwheels. I used one from Quilters Newsletter Magazine called “Tropical Spinner” as my starting point, then made the blocks bigger, since I hadn’t left myself enough time to do anything with triangles smaller than six inches. 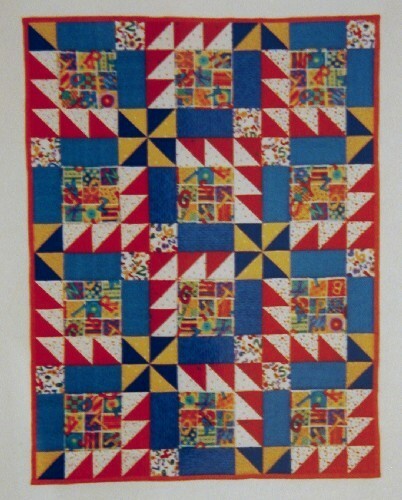 When I’d worked out the layout on Electric Quilt, I was quite pleased to see that just like the brother’s quilt, this one had three complete pinwheels. I’d used fabric with numbers and letters in the earlier quilt, so using other letter and number prints for this one further satisfied my need to have a connection between sibling quilts. My fabric stash seemed to know I had a short time frame–it didn’t make me search too hard for prints that coordinated with my focus fabric (which was even right where I remembered putting it, not buried in some stack deep in the recesses of the closet). I pieced the triangles with Big Thangles I had leftover from the two soccer baby quilts, so they went fast, and I strip pieced the nine-patches, so they did too. Most of the seams even lined up when I matched them, and three of the corners are fairly square. If I had it to do over again, I’d use a bigger variety of fabrics or at least not put two identical nine-patches on the same side of the quilt, but overall I’m happy with it. It’s cheerful, and it’s done. I am now caught up with all my coworkers’ babies, except the one that was born three weeks after the father started here at Purple Systems. Even though it seems unfair, that baby is not getting a quilt from me. Now that the company is twice the size it was when I started, I’m going to have to revise my baby quilt rules to clarify “work with one of the parents”. When the company was smaller, I talked to almost all of my coworkers weekly if not daily and knew at least a little bit about their lives outside of the office. Now there are people around that I haven’t spoken to since we were introduced on their first day. It’s not that I don’t like them (or their babies), it’s just that I don’t cross paths with everyone the way I used to. One year ago, I pondered what goes on in other people’s cars. Two years ago, my laptop refused to behave.